NEW YORK (CNS) — Even a masterful performance by one of its leads doesn’t always make for a satisfying movie overall. And so it proves with “The Fifth Estate” (DreamWorks). At the center of this fact-based drama, Benedict Cumberbatch turns in a splendid portrayal of Julian Assange, founder of the whistle-blowing website WikiLeaks. He skillfully captures both the charismatic and hostile aspects of his subject’s enigmatic persona. Yet director Bill Condon’s picture as a whole only engrosses attention fitfully. In part, perhaps, that’s because the story is told through the eyes of one of Assange’s closest collaborators, German tech whiz Daniel Domscheit-Berg (Daniel Bruhl). Domscheit-Berg, who helped maintain the secrecy of his work by using the alias Daniel Schmitt, comes across as a far less compelling personality than his mentor — but not one ordinary enough to serve as an Everyman figure and guide. On the plus side, weighty issues regarding free speech, personal privacy and public safety are raised and debated in screenwriter Josh Singer’s script, which draws on both Domscheit-Berg’s book “Inside WikiLeaks: My Time with Julian Assange at the World’s Most Dangerous Website” and “WikiLeaks: Inside Julian Assange’s War on Secrecy” by David Leigh and Luke Harding. Singer manages to elicit sympathy for Assange, moreover, by giving us a glimpse into his troubled childhood: His mother was drawn, through her boyfriend, into membership in an Australian cult called The Family. The sect is depicted here at least as fostering abusive treatment toward its adherents’ children. Despite these strong points, however, the proceedings are weighed down by an exaggerated sense of their own historical importance. Is WikiLeaks really ushering in an entirely new society? Is it a technological innovation so great that it ranks with the invention of movable print, as an opening montage suggests? Whether factual or otherwise, such claims make the film’s tone sound, at times, either pompous or feverish. The main personal conflict that arises for Domscheit-Berg because of the all-consuming demands Assange eventually places on him involves his relationship with his girlfriend Anke (Alicia Vikander). Though the two maintain separate dwellings, they are shown to be essentially living together, and a turning-point quarrel is touched off between them by the interruption of one of their sexual encounters. 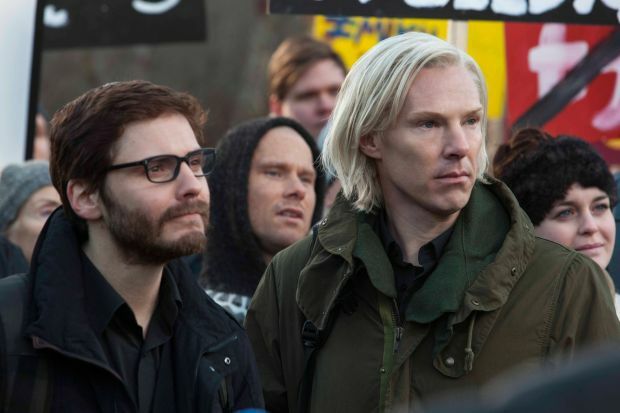 Together with a short scene depicting a brutal shooting and the vulgar character of some of the dialogue, this domestic situation restricts the acceptable audience for “The Fifth Estate” to those mature viewers willing to overlook its shortcomings for the sake of a single memorable turn. The film contains brief but intense violence with gore, cohabitation, semi-graphic premarital sexual activity, several uses of profanity, about a half-dozen rough terms and some crude language. The Catholic News Service classification is A-III — adults. The Motion Picture Association of America rating is R — restricted. Under 17 requires accompanying parent or adult guardian.